Barack Obama is worried about the Democratic party. 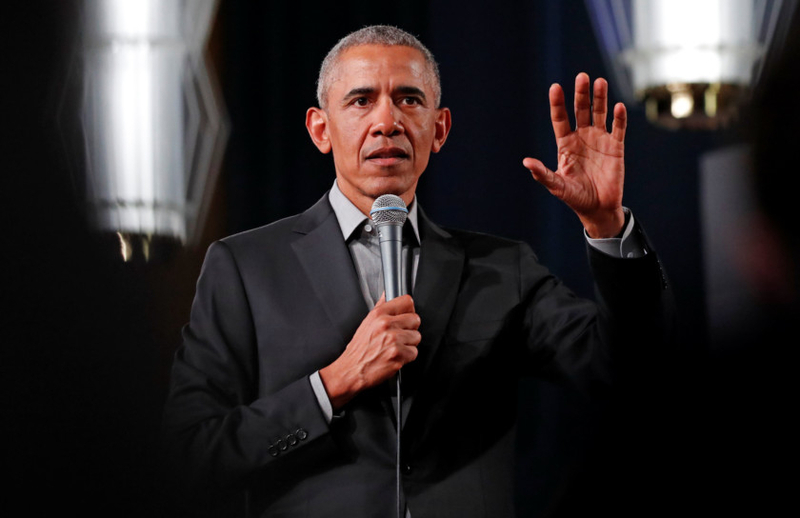 Last week, he told a crowd at an Obama Foundation event in Berlin that the party is becoming a “circular firing squad” targeting those “straying from purity” on certain issues. Leading figures around the party have indeed moved to the Left since he left office two years ago. Thanks in no small part to the Bernie Sanders campaign and the rise of Alexandria Ocasio-Cortez, Medicare for All, free public high education, a $15 (Dh55.17) minimum wage, and action on climate change have become mainstream positions. The self-described “political mainstream” hasn’t caught up to this new reality, however. Obama’s former vice-president, Joe Biden, hasn’t announced his presidential candidacy yet, and is getting attacked not just for his behaviour towards women but for a decades-long record that includes support for military interventions, mass incarceration, immigrant deportations, and more. The subtext of Obama’s remarks is this undermining of Biden. By comparison, Bernie played softball in 2016. But he certainly gave voice to grass roots anger. People are fed up with the status quo, and they’re starting to demand more of their politicians. Incumbents used to moving to an imaginary centre are running up against the fact that their “Centre” is an illusion. When most Americans support Medicare for All and a jobs guarantee, when they want an end to overseas wars, welcome unions, and even are starting to get comfortable with the idea of socialism, is it really “centrist” to stubbornly oppose all these things? Of course, Obama retorts, “You have to recognise that the way we’ve structured democracy requires you to take into account people who don’t agree with you, and that by definition means you’re not going to get 100% of what you want.” But the real problem the Democrats faced in 2016 wasn’t that they were too strident in putting forward a purist progressive vision. Rather, Clinton ran a campaign mostly about shielding Americans from the nightmare of Trumpism and not presenting dreams for the future. When people say they have been falling behind for the last 30 years and your retort is: “I can fix that, I’m experienced, I’ve been in politics for 30 years,” you might end up losing an election. This primary, Sanders and Warren are actually giving people a positive, comprehensible agenda to vote for, one that can speak to the justified rage so many are not willing to settle for a world destroyed by climate change, another year without basic health care, or continued precarious employment feel. For Obama, “We have to be careful in balancing big dreams and bold ideas with also recognising that typically change happens in steps.” But incrementalism during the Obama years were small steps to nowhere, ones that far from cementing a new progressive majority actually helped open the door to the populist right. Obama says that “if you skip too many steps you end up having bad outcomes”, but we’re now seeing what happens when you go into a negotiation — like he did with the health insurance companies — with an already compromised position. Bernie says “Medicare for All” and he means it, but even if you only wanted a public option, wouldn’t that be a better position to start from anyway? Like those who think lecherous “Uncle Joe” Biden is America’s only way to stop Trump, Obama is stuck in the past. The Democratic party has been transformed. Formerly fringe ideas are now winning ones. Obama and the centrist Democrats he backs are something like the old “Rockefeller Republicans” of the 1970s and early 1980s. They didn’t realise how out of step with the times they were until it was too late. Like former president Ronald Reagan did in 1980, the stage is set for Sanders to fundamentally realign the Democratic party, wielding together a coalition that can unite working people across America behind a social-democratic agenda for jobs and justice. Obama isn’t afraid of that kind of Democratic party losing to Trump. He’s afraid of it winning. Bhaskar Sunkara is the founding editor of Jacobin magazine and a noted columnist.